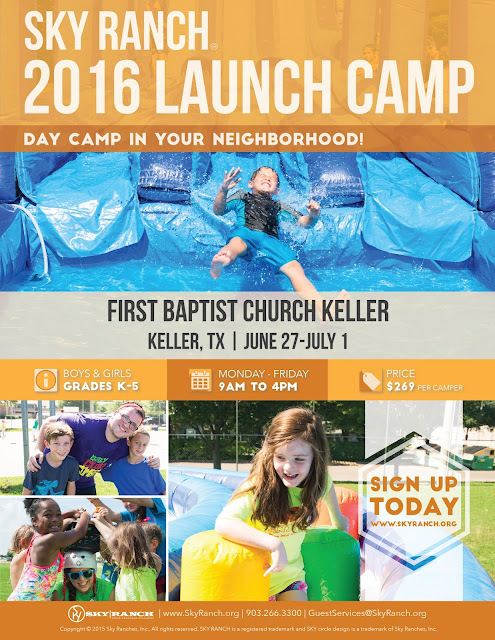 Registration is Open for Sky Ranch Launch Camp! I just signed my little one up for a Sky Ranch Launch Camp! We are looking forward to this trendy camp that has locations throughout the Dallas/Fort Worth metro. My little one attended the Sky Ranch "Wave Camp" last year and had an amazing time, so we were excited for him to attend another Sky Ranch summer camp this year - Launch Camp. In today's post, I'll share an overview of the Launch Camps and the schedule/locations for 2016. I will also share a discount code for $100 off of a one week retreat to Sky Ranch in Van, Texas. Sky Ranch is one of the leading Christian camps in the country and is well known for their trendy Launch Camps in the DFW metro. Sky Ranch Launch Camps give kids an extraordinary day camp experience right in their neighborhood. This summer is no exception - they have numerous Launch Camps available in June and July. These camps are a great way for little ones entering kindergarten through 5th grade to bond with other children in their local area with fun activities and a Christian based curriculum. We really like that it's a good quality camp experience without the overnight stay. 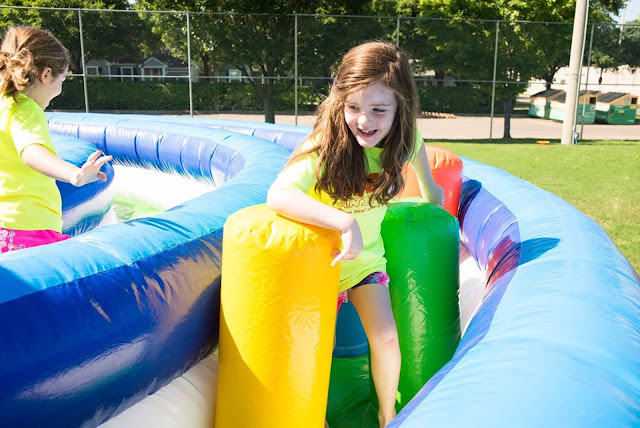 Sky Ranch Launch Campers enjoy five, fun-filled days of camp activities with suitable programs and positive encouragement from our caring and extensively trained counseling staff. In our personal experience, our son attended a Sky Ranch Wave Camp last year and had an amazing time. While Wave Camp is different than Launch Camp, I'll still share my experience from last year because I think that it shows the attention to detail and thoughtfulness that Sky Ranch puts into the camps. I think that Sky Ranch is so wonderful for little ones! Bringing my son out of his shell: We had a great experience at Wave Camp! I was initially nervous because my son was only 5 years old, doesn't know how to swim, and didn't know anyone at the camp. He was a bit timid initially, but the counselors were so enthusiastic and their warmth and friendliness was contagious. They were great role models and fantastic with the kids. The games and ice breaker activities made him quickly acclimate to being part of the group. The other children at the camp were sweethearts and he made good friends. While Launch Camp is not at a water park, I am looking forward to the similar environment where the staff helps the children to come out of their shells and bond with each other to have fun. Safety: They took safety seriously which was great. Each child was issued a bright orange Wave Camp t-shirt. They were bright and you couldn't miss them! They blocked off a special part of the park for the kids that was private and shaded. The area included two tents for them to store their gear and tables. They also had a dedicated golf cart that they rode on. (My son will tell you that the golf cart was awesome!) They started the kids with a swim test on the first day. My son doesn't know how to swim, so he used a life jacket. I appreciated their seriousness about safety. My son told me that they had strict "laws" such as staying in front of the teachers in the Lazy River. I had to laugh that he called them "laws". I'm still not sure if they called them laws or if my son made this up, but I was very happy that the safety rules were clear and respected. Again, Launch camp is not at a waterpark, but I think that all parents appreciate that Sky Ranch takes safety seriously for our little ones. Lessons: The director gave us a handout when we picked our son up each day so that we knew the bible lessons and activities for the next day. This gave us the opportunity to engage our son in discussions about his lessons at home so that we could reflect together. They have such a positive attitude and offered transparency so that I could easily extend his education at home. My son's favorite day had the theme of Lights, Camera, Animals. He is so curious and loves animals, so this was his favorite day of the camp. He was such a happy little chatterbox after the lessons! Lunches: Daily lunch was included in the registration fee. They were great about communicating the daily menu so that I had input on what my son ate and drank. My son raved about the pizza and burgers. He also loved the berry juice. Fun activities: The Wave Camp started at 8am each morning. This was quite a luxury since the general public doesn't have access to the park until 10am! The Wave Camp counselors and kids had the park to themselves for two full hours. My son raves about how much fun it was to play in the park with his camp friends. These are memories that I am sure he will always treasure. The last day of the camp included a closing ceremony. You could tell that the counselors and children loved each other. We left feeling so fortunate and blessed that our son was able to be a part of this wonderful camp that had a large impact on him. In summary, my takeaway from this experience is that the SkyRanch Wave Camp was well organized and provided a memorable opportunity for children. I was a bit nervous that my son was on the younger side, but the great staff and policies quickly relieved my worries and we felt comfortable. 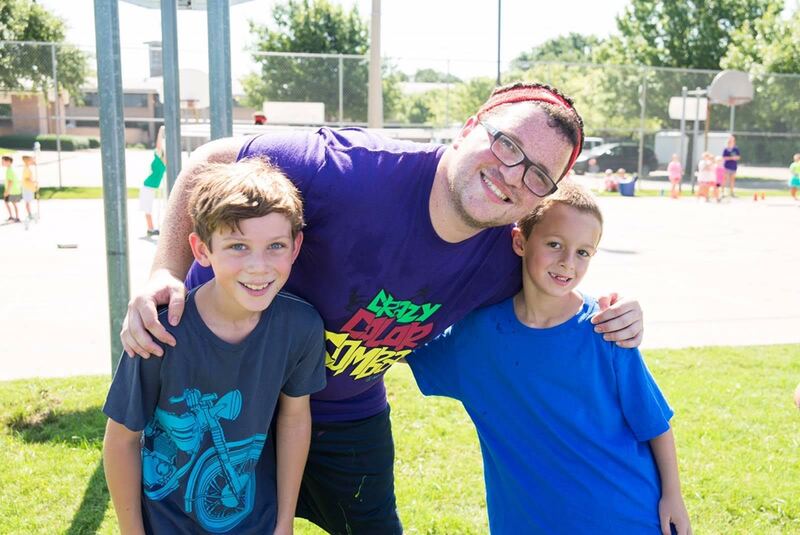 They know how to run an awesome camp that is inclusive of all of the children! I can't say enough good things about the wonderful experience that our family had by sending our son to Wave Camp. We definitely recommend trendy Sky Ranch camps to other moms that are in the DFW metro! We are thrilled to send our little one to Launch Camp this summer! We hope that you are similarly able to send your little ones to a trendy Sky Ranch Launch Camp! In addition to Sky Ranch Launch Camp, let me point you to a fabulous retreat. Click here to learn more about Sky Ranch in Van, Texas and use discount code 2016SCBlog for $100 off of a one week stay!